A year on the road meant spending a lot of time in bunk beds, hotels, and even a few couches. Let’s take a look at some of the challenges and highlights of living out of a suitcase for a year. Accommodation that was included as part of a tour package (such as my time in North Korea), is considered to be “free” (a cost of $0.00). This is also the case where I stayed at a friends house or had a hookup at a hotel or hostel. All prices are in Canadian dollars and include nights where I might have paid for accommodation, but didn’t actually stay there. When staying in hostels, my preference was always the smallest dorm room (usually 4 beds), which is also the most expensive dorm option. About three nights were spent on overnight travel (bus, ferry, red-eye flights) and are not included in the data here. All in I spent $18,295.06 to keep a roof over my head for 355 nights, which works out to an average of $60.02/night. The most expensive hotel I stayed at was a last-minute trip to St. Petersburg, Russia. A three night stay at the Petro Palace Hotel set me back $779.97. The cheapest per night rate (at at $13.07/night) was in Marrakesh, Morocco at the Dream Kasbah Hostel. In the majority of cases, I booked accommodation within a few days of when I needed it. In every cases, I would always have a place to stay on the first night after arriving in a new country. 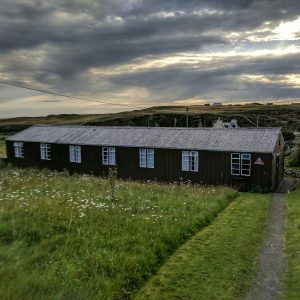 Durness Smoo Hostel in Scotland. First, I would check the availability of hostels. Using Hostel World to try to find a place to stay for 1-3 nights. If I wanted to stay longer, I can always extend my stay the day before check-out with the reception desk. Experience showed me that sometimes you can get a better rateextending your stay this way, rather than rebooking through a website. If there were no 4 bed dorm rooms available, then I would move on to AirBnB, then finally Hotels. In some countries, the price difference between a private room in a hotel and a bed in a dorm was negligible. In this case, the Hotel would win. For booking hotels, I used Expedia or Booking.com. Usually there was no price difference between the two sites. However, the inventory and selection of hotels differed between the two. I have never booked accommodation the “night of”. There is no benefit to waiting last minute. Prices wont be any cheaper, and you aren’t guaranteed to have a room available. There are some people who travel solely using couch surfing and staying with friends. This is a great way to save a lot of money at the expense of privacy. I only did this twice, once in Bogotá, Columbia and Dublin, Ireland. There are some inherent risks staying in a strangers home, even as a male. I learned this first hand with my couch surfing host in Dublin. I was able to have few nights for free in Hong Kong thanks to a hookup through Bumble. Yup! A date went so well, that she offered to let me stay with her for the rest of my trip in Hong Kong! Two nights in Vienna were thanks to someone I met in Colombia 6 months earlier. It pays to keep in touch with people you meet while on the road. Of all the hostels I’ve stayed at, El Pit in Bogotá was hands down my favourite. The owners are a bunch of professional chefs who have a passion for tourism. The food is amazing and the beds are comfortable. Not having to store my luggage or lug it around town, I tried my best to have my flights arrive within 1-2 hours of when I can check-in to my accommodation. Red-eye flights or overnight trains were the worst for this. You would arrive to your destination at 6:00 or 7:00 in the morning and wont be able to take a shower or change your clothes until early afternoon, after checking-in. In my experience, it never hurts to ask if you can check-in as soon as you arrive at the hotel. Even if the check-in time is (for example) 4pm, your room might be ready earlier! Organizing a time to meet your AirBnB host for check-in can be a huge pain, especially if you don’t have a place to store your luggage before the meet up time. Try to book an AirBnB with a self check-in option. Check-out time is usually 11am or 12pm. So be sure to book your flights home around that time! That way, you are not “killing time” between check-out and when you need to head to the airport. Late check-out can be handy, but it comes at a cost at most places for only a few extra hours. The most swanky hotel also happened to be free! I couldn’t pass up the opportunity to spend a few nights in the Four Season Resort and Residences in Anguilla. A really good friend of mine invited me to stay with her while she was temporarily assigned at the hotel. An advantage to keeping a flexible itinerary is to be able to take advantage of last minute opportunities such as this one. 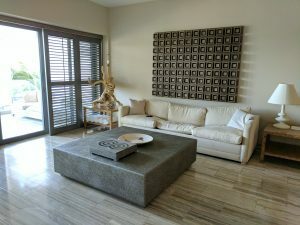 The living room of my hotel in Anguilla. The unit was a three bedroom apartment with a full kitchen, patio, and plunge pool. Overlooking a pool and with an ocean view, it was a great way to relax and unwind during my travels. There is no way I could have afforded this place on my own, so I am forever in debt to my friend. There is no better feeling than to be able to plop down into a clean bed after a long day of hauling your luggage around. I’ve never had issues with bedbugs, dirty AirBnBs, or other issues with my temporary home. Read reviews and don’t book the cheapest option. You do get what you pay for!